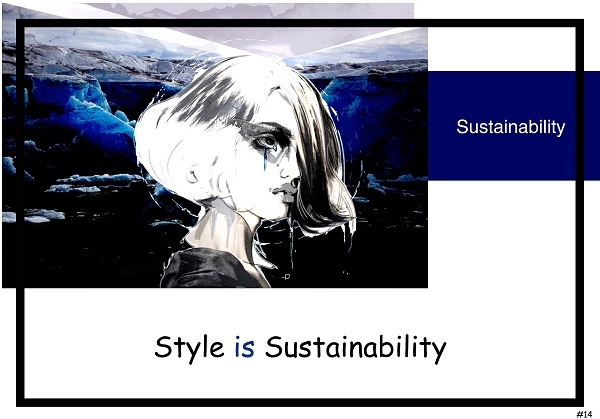 I'm Rossana Diana from Milan and I'm here to present you my work, my point of view about fashion and sustainability. I want to show you how is it possible to do a product without producing anything using the main prooduct of Capitalism: The Waste. 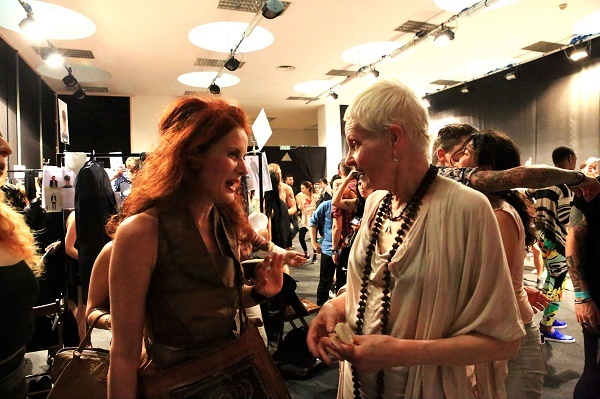 As you can see from this picture I'm with the english designer Vivienne Westwood. This working experience it’s definitely my most important and beautiful one. I had the pleasure of worked with her as designer during 14 years. Today our relationship it’s still very strong; is not a case if nowadays we do activism together to stop climate changes. 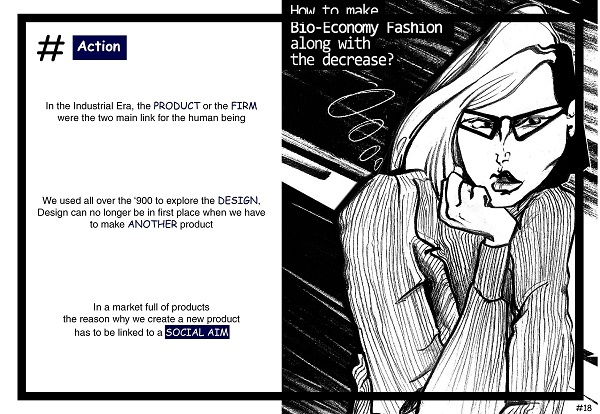 Already in 2000 I felt that the fashion industrial system was not so close to the real needs of the market in its way of making clothes. But only in 2006 my life really changed; this is happened thanks to a book. 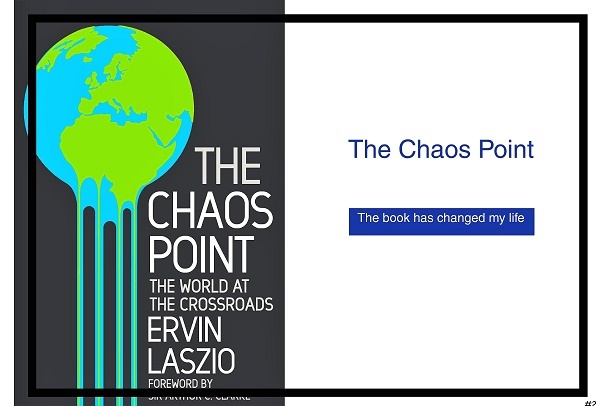 Chaos Point written by Ervin Laszlo, Ervin Laszlo is a scientist which was born in Budapest. Reading Laszlo has helped me to understand the importance of the individual action and the real meaning of sustainability. 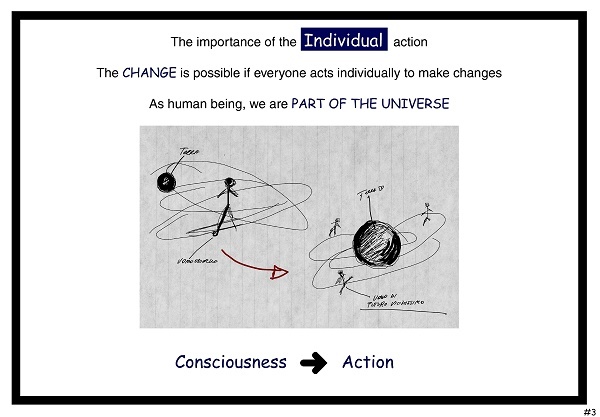 Changes are possible if everyone acts individually because as human being we are part of the universe. 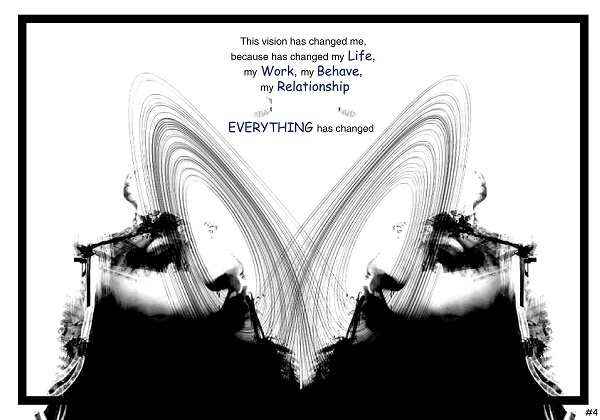 This vision has changed me completely, because has changed my life, my work, my behave, my relationship: everything has changed. Now let's make clear that I'm not Venette Waste because she's better than me, I work for her , she is my guru , the icon of my organization because over all, she's a queen! Are you ready to meet her? 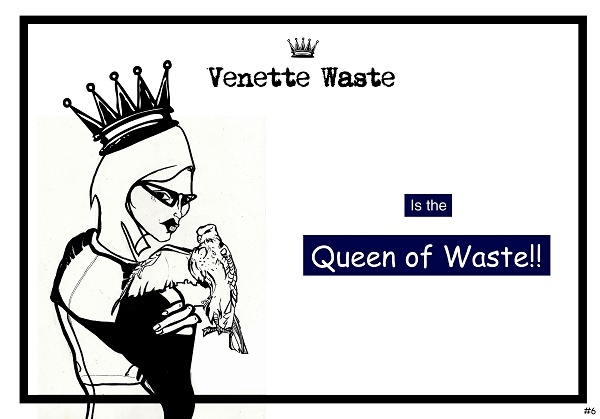 Well let me introduce to all of you, Madame Venette Waste! 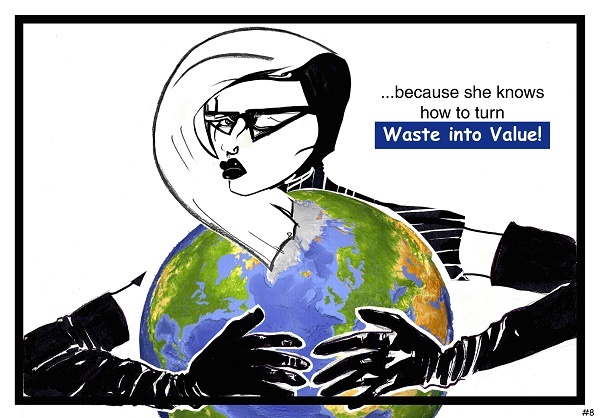 Because she knows how to turn waste into value. She was created one day on March 2009, by my soul and by the hand of Irene Bassi. I thought that I would have need somebody different from myself leading the organization. 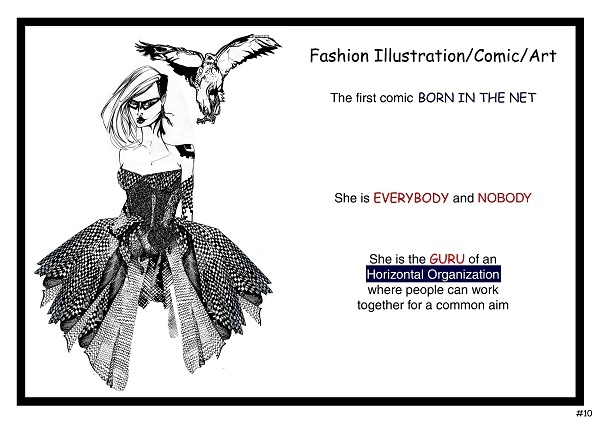 Under her, an illustration, it would have been easier to be an horizontal organization, where everybody at the same level could have given its contribute to make fashion world more sustainable and because a comic could have better mirrored. To be everywhere, magic, with a certain power as a super hero, but a european one, that, on the contrary of the Americans, bring us back to reality. That's why we created for her a sort of life, real life: she was born in 1966 you see here with the parents , when she was a child , going to school , in the adult age with her son Eddy. 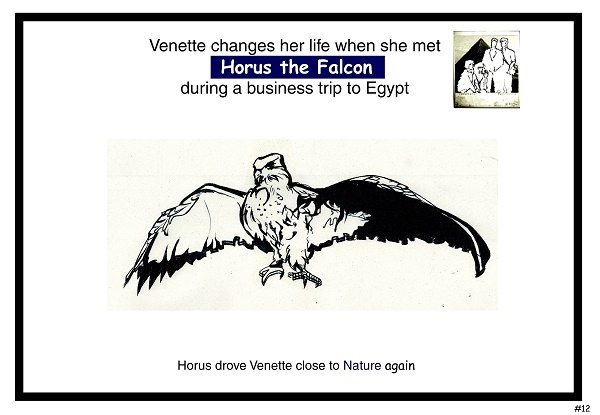 and in the magic moment that sign the change of her life: when she became the queen of waste, and exactly when she met in Egypt, during a business trip, Horus the falcon at the Edfu Temple, that moment represents the vision, the way she has reached the consciousness. 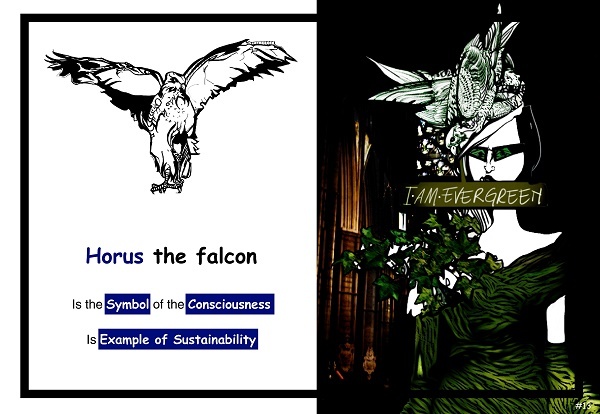 Horus the falcon, that driving her back to Nature, will be her spiritual guide forever. 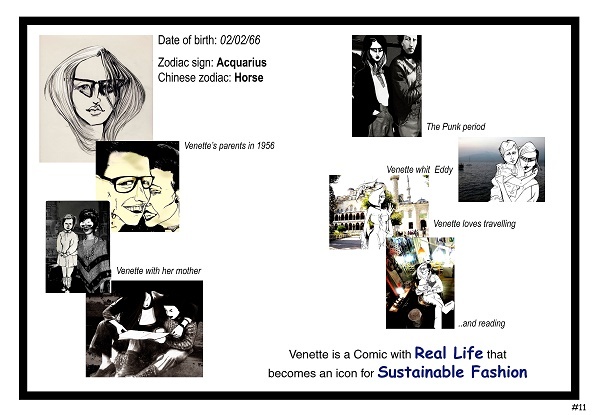 In that moment Venette has changed and won't be anymore what she was before , she now knows what she has to do; viralize sustainability in all whole fashion system. 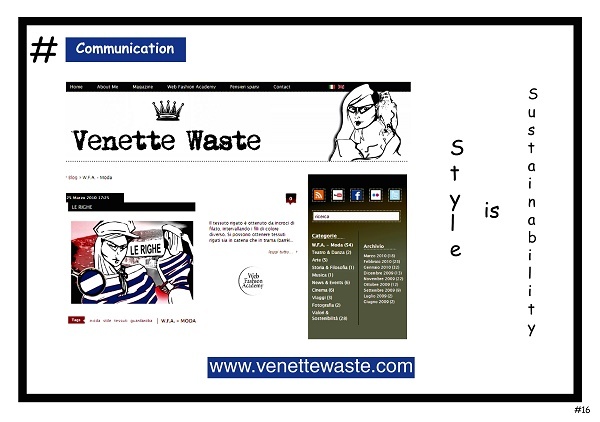 Venette always says that style is sustainability. Let's try to follow her to understand better what does this mean. First of all to do that she act in two steps, Communication and Action. Why communication? Because she thinks that every project, everything somebody does as a profession , as a job nowadays should be first of all considered as a communication project because we need to change everything and, to change everything, any product should be use like an instrument to show how to do that. She’s born on internet so she has got a blog where daily she post and speak about Sustainability. 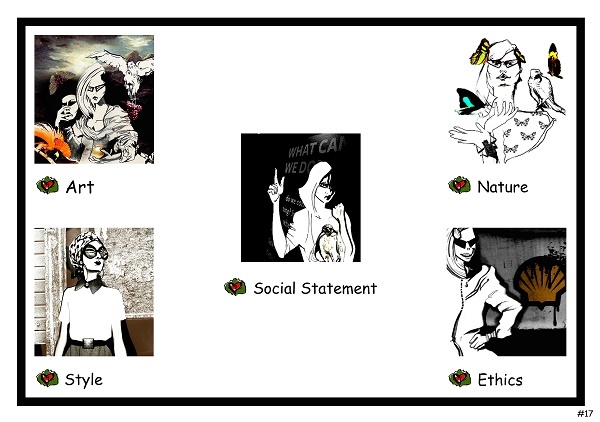 Through Nature, Art, Style, Ethics and Social Statement. Action is very important too. 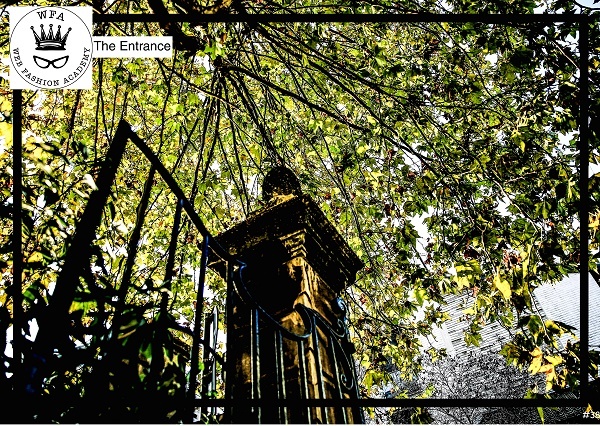 The Venette action start from a deep consideration: in the Industrial Era , the product or the firm were the two main link for the human being, and in fashion for sure we have used. We had all over 900 century to explore design, with incredible result. But in a market full of products, and beautiful products, design can not longer take first place when we have to make another product, the reason why we create another product has to be linked to a social aim. 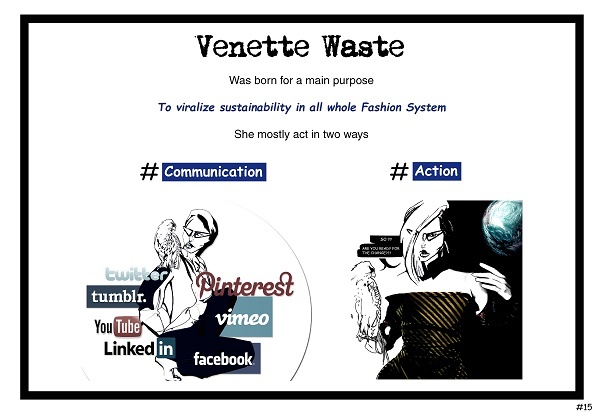 That’s why Venette Waste in action has created the Waste Couture. Now here we see the logo, isn’t it nice? The crown is the material , everything is tangible , the Venette glasses instead represent the immaterial , the intangible, culture , knowledge and spirituality, using waste you can make a balance between material and immaterial because, at the moment, we can say that we live in a society where material value is crucially overestimated. 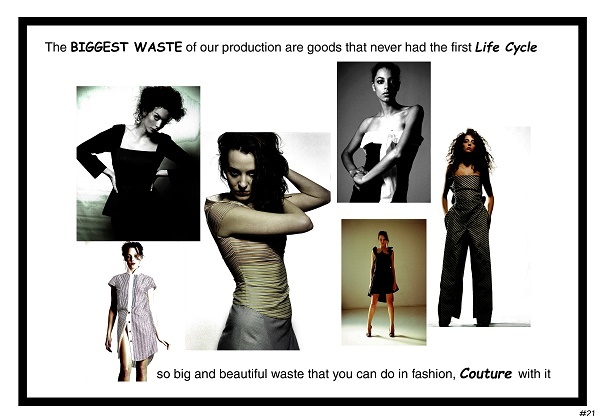 How does Waste Couture fight against that? 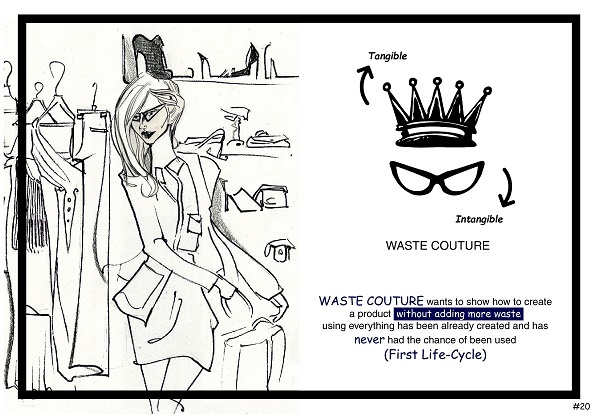 Waste Couture wants to show how creating a product without adding more waste as possible. Using everything has been already created and has also never had the chance of been used before. Often we speak a lot about recycle; when we do not consider that the real waste of ours production, are products that never had even the first life cycle, and they are big, the biggest waste. So big and beautiful that you can do in fashion, couture out of it. 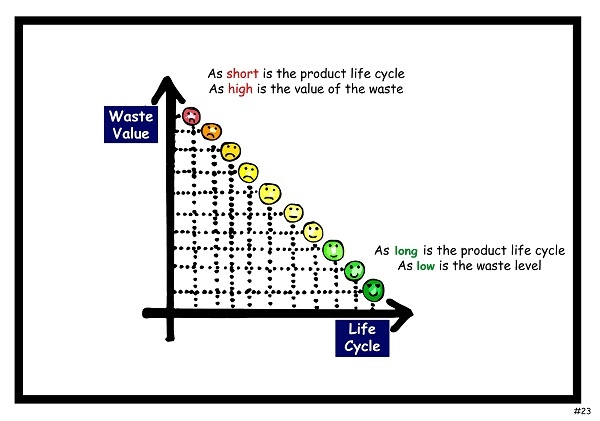 Because this value is strictly connected to the waste value and in an inversely proportional way, how we see now in this graphic, as short is the product life cycle, as high is the value of the waste, inversely, as long is the product life cycle, as low is the waste level. 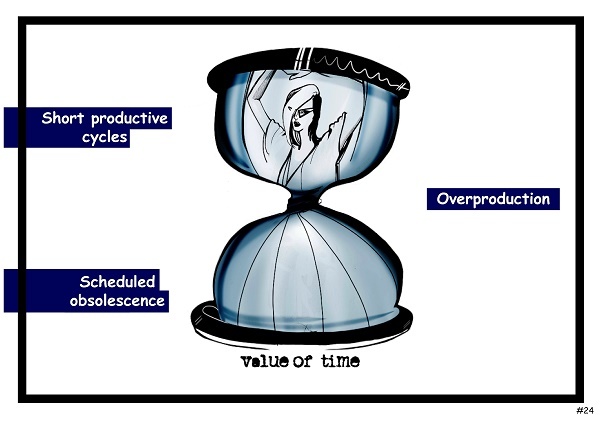 Now we can say that fashion is not living an healthy period when is founded on short productive cycle , scheduled obsolescence and push everybody to have always a new garment in their wardrobe. Because turning away Economy from its original meaning. 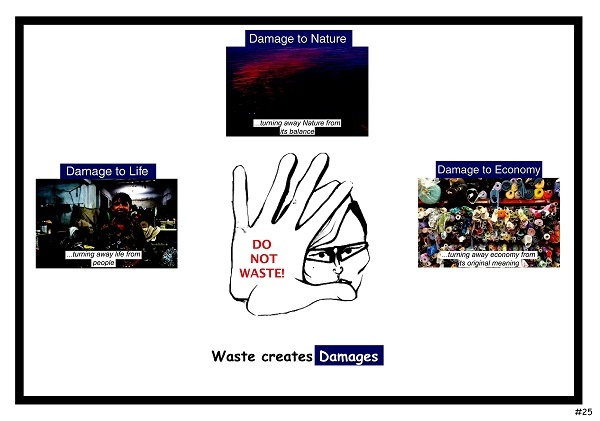 Using waste means bring back economy to its original meaning, how can be healthy an economy where in every field gets as a main product what should never produce to continue to exist? Is a paradox! 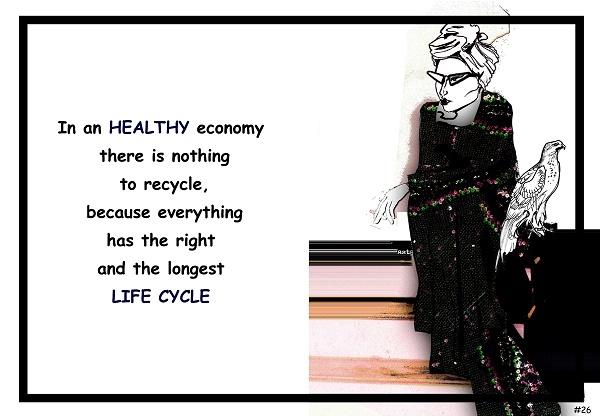 In an healthy economy there is nothing to recycle, because everything has the right and the longest life cycle. And if something remain is something so small that Nature make her job to recycle it. You do not need to think about it! Act re-cycling nowadays is necessary, but should not support a wrong attitude to consume. 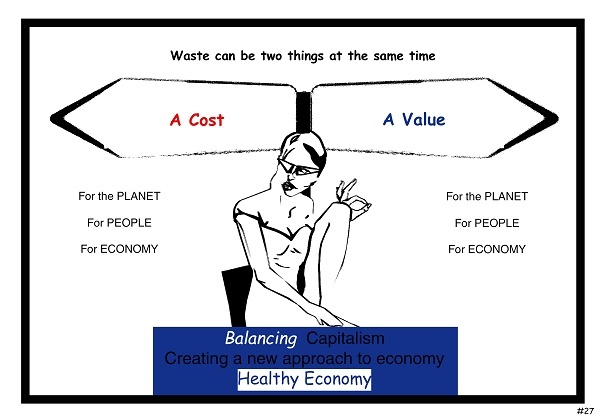 Try do not waste anymore using waste as a value must be our priority now, waste can be two things a cost or a value, for the planet, people , economy it’s really up to us to decide which direction to get if we really want to balancing Capitalism and create a new approach to economy. 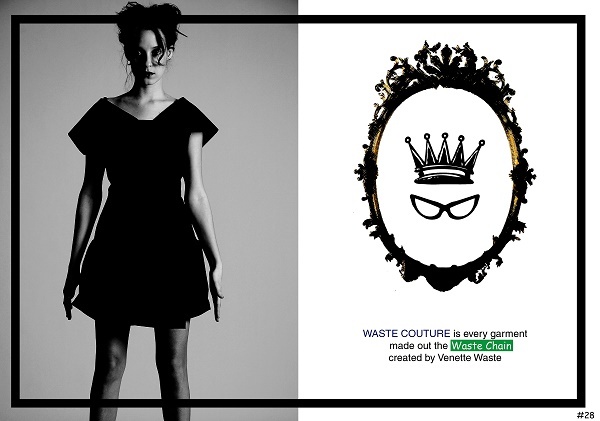 Waste Couture is every garment made out the waste chain created by Venette Waste. 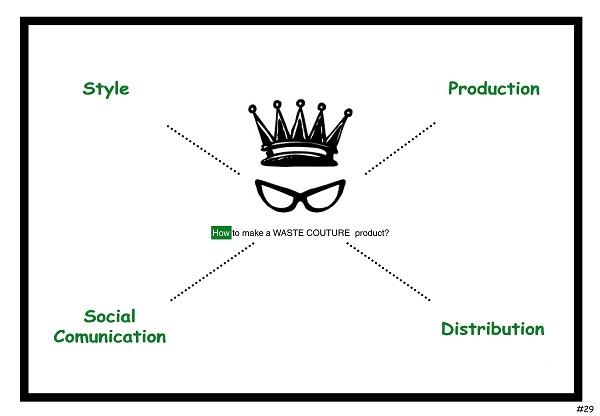 Let’s see now how do we make a Waste Couture garment in every of this aspect: Style, Production, Distribution, Social Communication. Creating style beyond fashion, seasons, a garment with contents to survive in every wardrobe forever. Forever means as longer is possible with high fabrics and accessory quality, with a design which avoiding only to follow trends and look, and which is able to take care of paying more attention to the individual fit and needs. A garment that show how much is important to keep in balance the excellence of the old tailoring experience with the knowledge of the industry system to do the contemporary product. Make research to realize pattern by components to use better wasted fabrics, using all those tricks that make possible a garment renewable and easy to care. 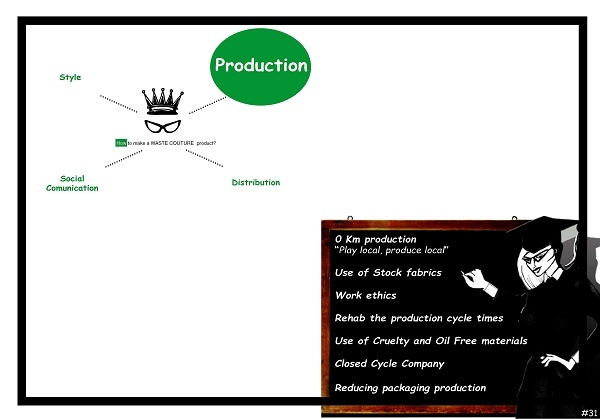 Producing at 0 km , means as much as possible close to your customers, using only fabrics and accessory already produced or produced with continuity, rehab the production cycling saving dates out of the ordinary production system, respecting time and life of the people is working to do these garment, using preferably cruelty and oil free materials. Reducing packaging production, becaming an example of closed cycle company. 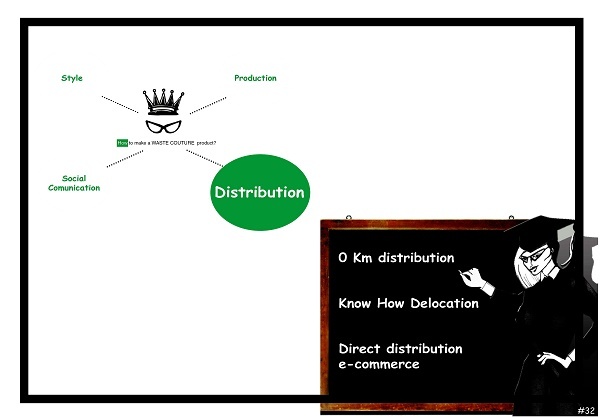 Distribution at km 0 , means as much as possible close to the customers creating a network trough specific e- commerce, delocalizing only know how. 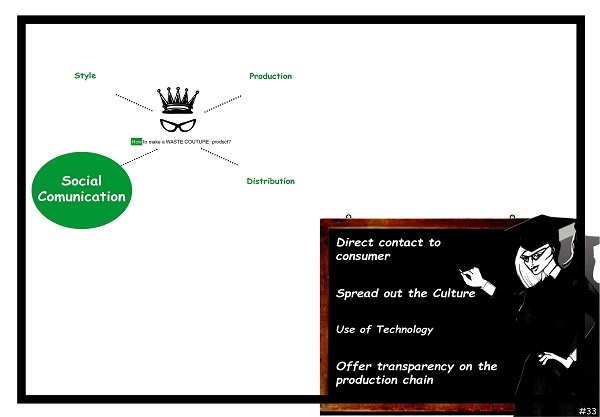 Linking production direct to the final consumer.. 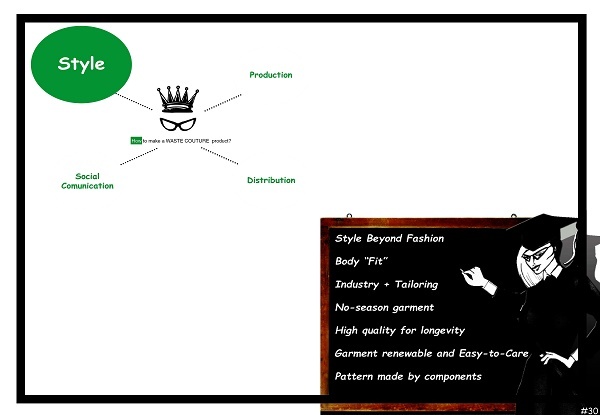 Using technology spreading fashion culture, styles method, art, culture, fashion history, showing production processes and trasparence to the product chain, giving support and kind attention, answering directly to every customer need. 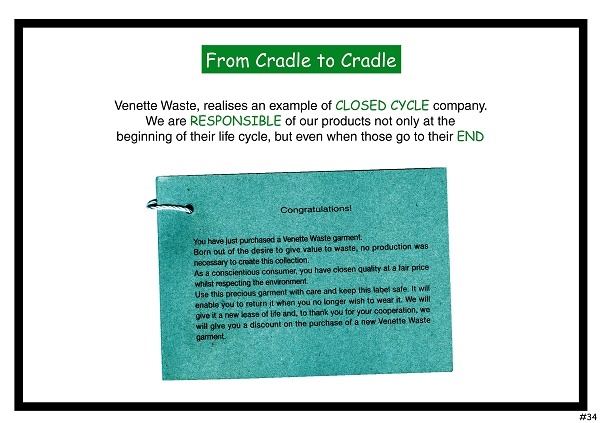 Venette Waste trough the Waste Couture system realizes as well an example of closed cycle company, responsible of the products not only at beginning of their life cycle but even when those go to their end. Do you never ever reconsidered that the highest value of waste in a single fashion product is the label tag? Customers when receive the garment is the first think, together with the packaging that trough away! Venette has used this element in her action to change, giving to this tag a longer life: eternal! Let’s read together what is written on. 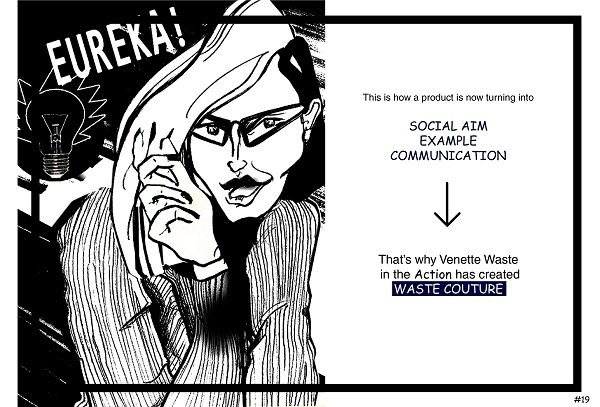 Congratulations, you have just purchased a venette Waste garment. 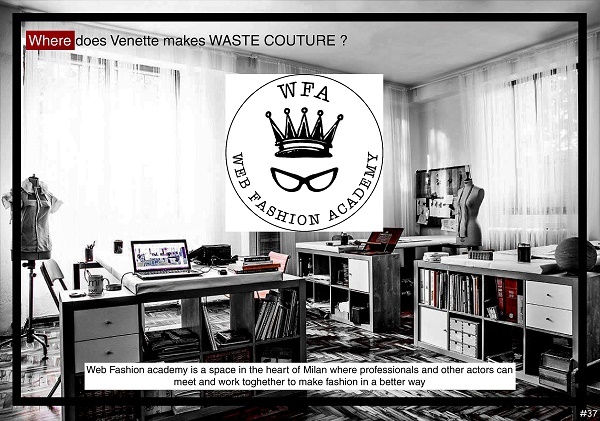 This is the only case that a Waste Couture garment can be de valuated with a discount, when you help Venette to do something good for everybody, is a prize! 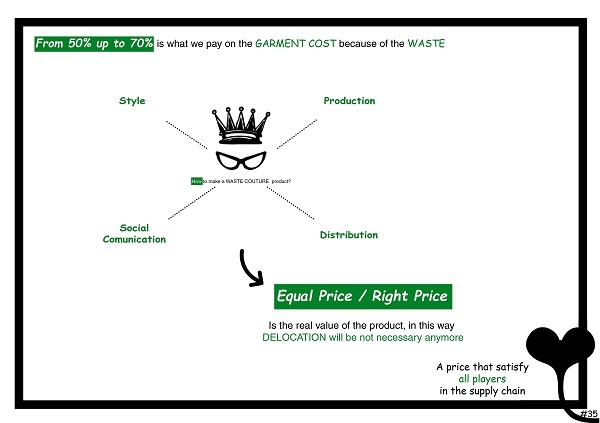 From our research we discover that the value of the waste affect the garment price from 50 up to 70 per cent. 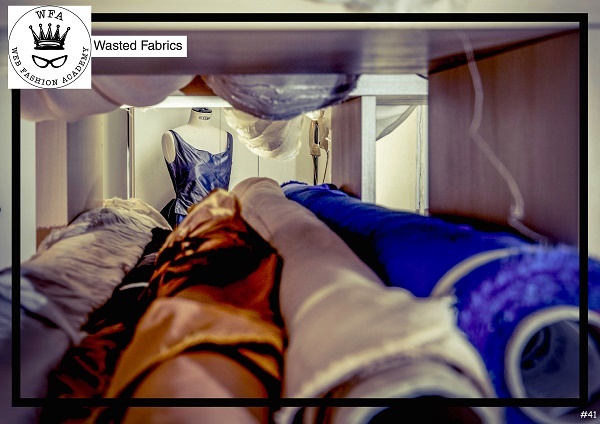 Applying the Waste Couture method you get back the equal price , the price that exactly matches the real value of that garment. In this way de localized will be not necessary anymore. This was the product culture that has made famous “ The Made in Italy “ in the world. With our organization we are committed to keep this system alive, against every wild globalization. 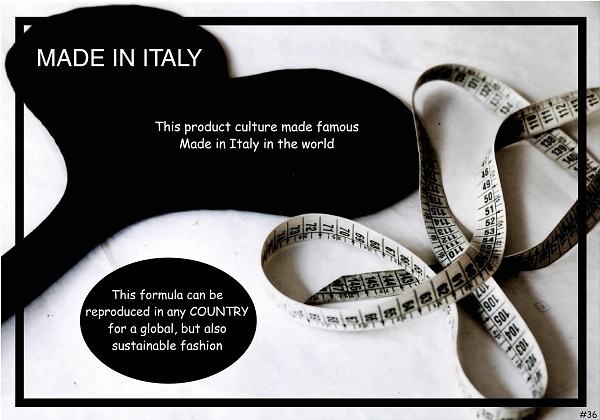 This formula can be replied in every country making every Made in, virtuous, upstanding and honest for a fashion not only global but, first of all, sustainable. 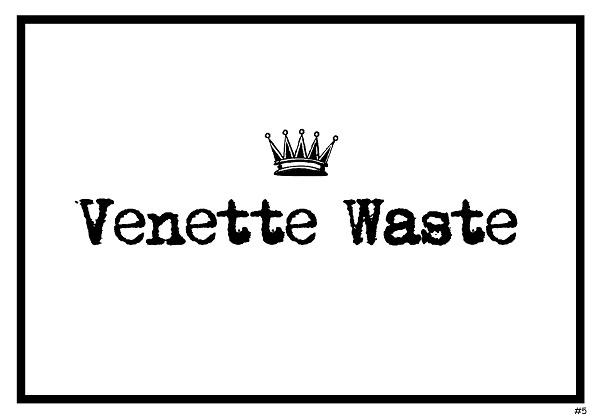 Where does Venette make Waste Couture? 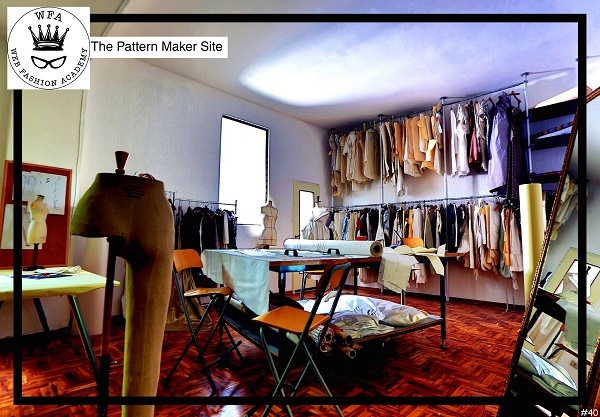 Web Fashion Academy is a space in the heart of Milan where professionals and other actors can meet and work together to make fashion in a better way. 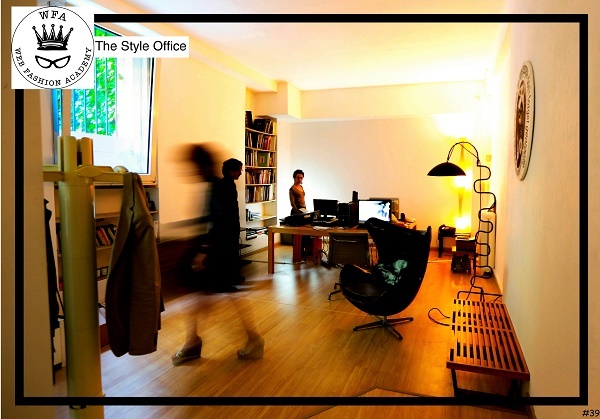 A space very well fitted having as well a function of coworking , cozy and functional, for everybody want to be helped to do fashion in a sustainable way. 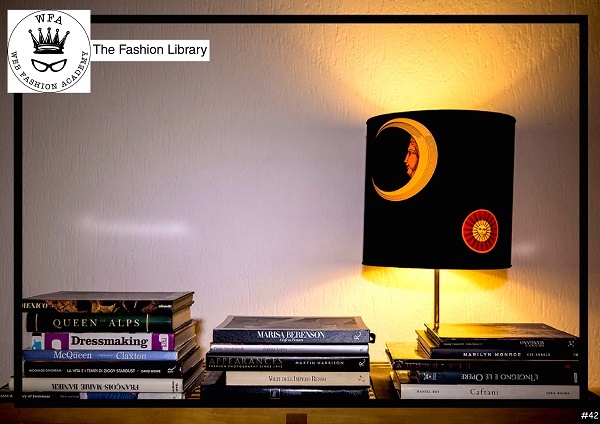 fashion library, archive , accessory and materials make this space performant to make every kind of fashion product at 0 Waste. 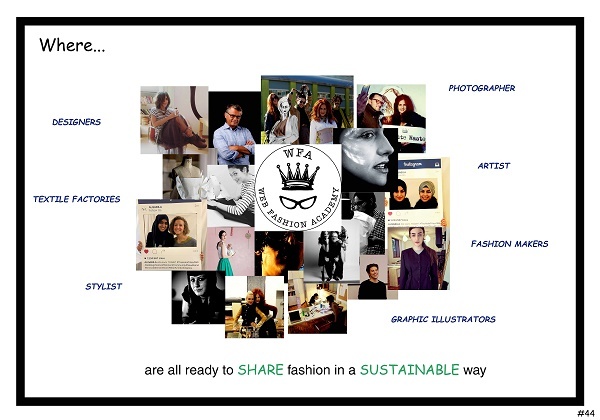 Where Designers , Stylist, graphic illustrator, artist, together with a net done between textile factories , and fashion makers are all ready to share fashion in a sustainable way. 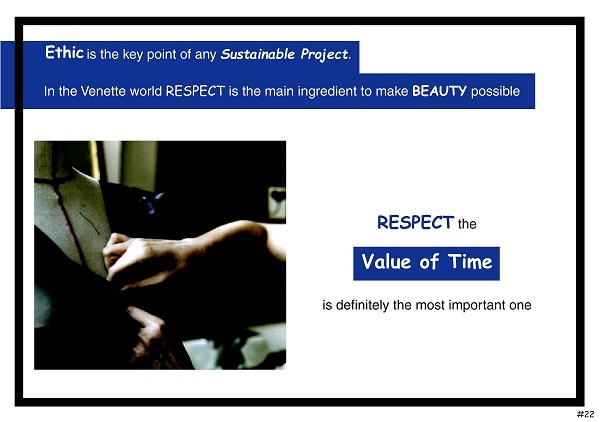 The final goal will be to have each projects respect all the conditions. We firmly want to help everybody to go in a sustainable direction. 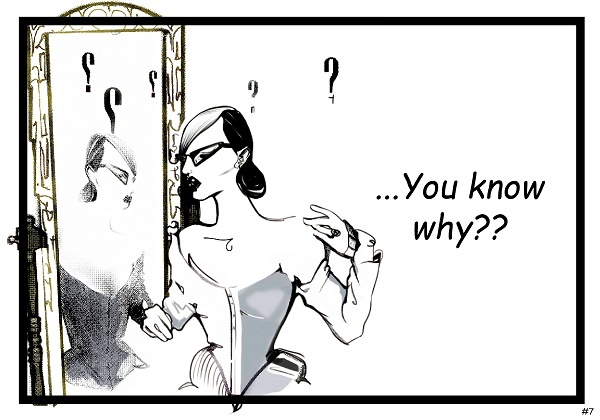 At Web Fashion Academy we do run a lot of projects, very different ones. 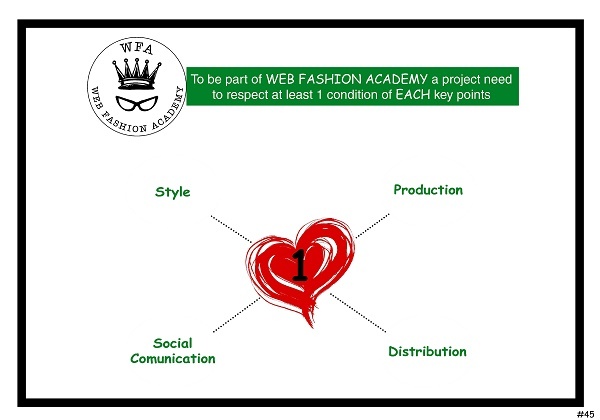 We really would like with your collaboration make possible that Web Fashion Academy became an international reality. It would be great to have different academies all around world join together the future of fashion system. So here we are at the end of our presentation, thank you very much for your attention and remind: if a comics did it everybody can do it , in this economic and financial governed world ,before to be humans we have to admit that we are merely numbers: consumers and producers. As a riot consumer I want to suggest to everybody of you to change completely the way to approach to the consume, do not buy global if you are local, and you are. As a professional I want to suggest to every designer to redefine themselves as fashion revealers: with a humble attitude recognize that mother Nature has already done everything and who owns vision can be only a revealer of her great creations. As a human being: be always very pleased to give. We would like broaden the network with everybody of you. And you, which game you care to make endless?